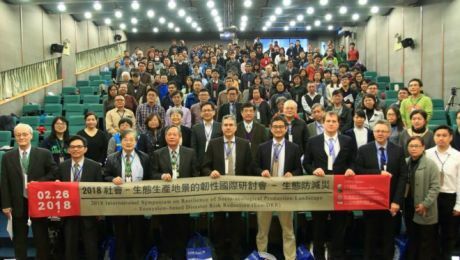 On 26 February, UNU-IAS co-organized the 2018 International Symposium on Resilience of Socio-ecological Production Landscape – Ecosystem-based Disaster Risk Reduction (Eco-DRR), held at the Center for Condensed Matter Sciences of National Taiwan University in Chinese Taipei. Organizers included the Soil and Water Conservation Bureau of Chinese Taipei (SWCB), the Society for Wildlife and Nature (SWAN International), the Biodiversity Research Center of National Taiwan University, and the Secretariat of the International Partnership for the Satoyama Initiative (IPSI), which is hosted by the UNU-IAS International Satoyama Initiative (ISI) project. UNU-IAS ISI Communications Coordinator William Dunbar was invited to speak about “The Satoyama Initiative, IPSI, and Eco-DRR”, and emphasized the role of landscape diversity and a holistic landscape approach to resilience in avoiding and mitigating the negative effects of various types of disasters, including a number of IPSI Case Studies and other projects related to UNU-IAS work in landscape resilience and Eco-DRR. Also speaking at the event was Fabrice Renaud, formerly of UNU-EHS and currently at the University of Glasgow, and other experts on Eco-DRR and related fields from within Chinese Taipei and around the world. On 27 February, the guest speakers were also invited by SWCB and the other organizers to visit two communities in the field where DRR infrastructure projects have been implemented including ecosystem-based and landscape perspectives, and invited to provide comments and advice. The organizers stressed that Eco-DRR is a relatively new and unknown concept in Chinese Taipei, so the symposium provided an excellent opportunity for policymakers, members of the academic community and on-the-ground practitioners to learn about and consider how ecosystem-based approaches can improve and complement current DRR practices around the island. 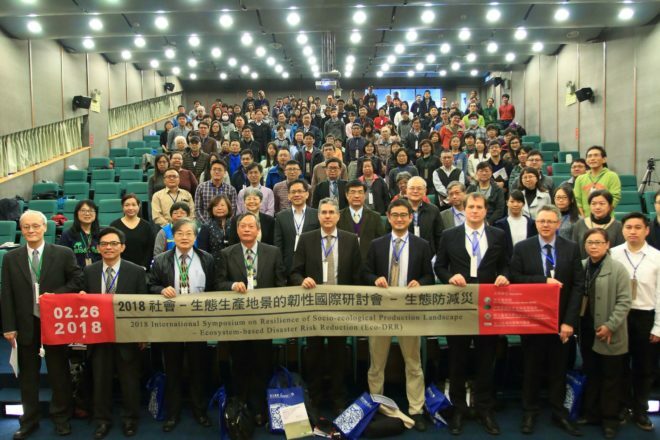 The event was covered by local Chinese-language media, including the Central News Agency.